Riverstone Holdings Limited, an investment holding company, manufactures and distributes cleanroom and healthcare gloves under the RS brand. It also produces cleanroom finger cots, packaging bags, face masks, and wipers; and other consumables, such as hair nets, static dissipative shoes, safety booties, shoe covers, ESD rubber bands, sticky mats and rollers, swab-polyester and microfibers, antistatic gloves, static dissipative shoes, cleanroom coveralls, and cleanroom papers. In addition, the company trades in latex products; and distributes cleanroom products. Further, Riverstone Holdings Limited offers healthcare products comprising white, blue, black, and accelerator nitrile exam gloves. Its products are used in the hard disk drive, semiconductor, and healthcare industries. The company exports its products primarily to the Americas, Asia, and Europe. Riverstone Holdings Limited was founded in 1989 and is based in Singapore. Trade_Jo now is going short? chiongster1234 how is the AGM? anyone? NicholasNWH90 Chiongster no other shareholder is here. i3 Singapore has so few users. NicholasNWH90 No leh. Anything to share about this company? chiongster1234 what do you think? haha. which counter you hold in SGX? LanSeeBoy industry & valuation ve peaked. Only way is down. LanSeeBoy 1Q gross margin came down from 31.6% to 29.1%...1st sign of more margin erosion ahead as competition intensifies from industry growing capacity. purchase of a piece of land. RM123.8 million worth of cash and cash equivalents. LanSeeBoy Margin coming down as competition intensifies...the new expanded capacities by larger peers all coming on stream...even demand remains firm, supply-side will sure bring asp downward. Expect massive de-rating months ahead for this sector which has over-enjoyed peak valuation for past 2 years. chiongster1234 being shot down, short short short? LanSeeBoy Despite seeing a better long-term prospect from further boost in its production capacity, I'm very concerned on the industry over capacity could lead to intense price competition. Expect poorer 2Q. chiongster1234 faster drop please, i can't wait to all in my wealth with you. so next time can growth together or holland myself. LanSeeBoy Glove giant Top Glove net profit dropped 40mainly due to pressures on its average selling prices and higher operational costs. Riverstone will suffer same problem. Dump your shares before is too late. LanSeeBoy >40% of sales from Europe(incl. UK), Riverstone outlook could be badly hit going forward. chiongster1234 lanseeboy, u are damn right. financial year ending 31 December 2016.
credited with shares at 5.00 p.m. on 3 October 2016 will be entitled to the proposed interim dividend. The proposed interim dividend will be paid on 13 October 2016.
chiongster1234 just wonder the management how to handle New Levy policy called EMC which would make employers responsible for bearing the cost of the foreign worker levy rather than the foreign work themselves. chiongster1234 Better than cpf return, cukup. 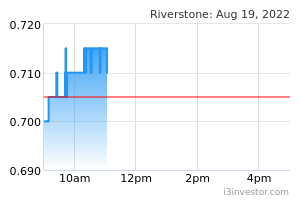 susansgxtrader Shares of Riverstone Holdings Ltd/Singapore (AP4.SI) is moving on volatility today 5.94% or 0.06 rom the open. The SES listed company saw a recent bid of 1.070 on 1690000 volume. 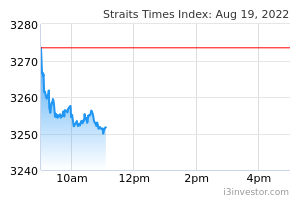 "Hi All, for those miss out the glove counter share price rally, look beyond Bursa exchange. Study on this Riverstone glove maker (SGP exchange), small/med cap, but highly efficient or equal to Hartalega. This remind me on last 7yrs when Hartalega is a small glove company, unspotted and below investor radar below RM500mil company, but now super powerful, now worth RM 18bil company. Riverstone 3Q17 net profit RM34.3mil (+26.8% QoQ ), zero debts company, net cash position RM112.4mil, ROE 20.7% growth annually (avg 5yr), divident payout ratio 40% - 45% annually, Gross profit margin 27%, net profit margin 18.7%. In term of plant expansion, glove output increase additional +1.4bil pcs, start commission & fully operate by Q4'17 (Phase 4). This raise additional capacity of 22.5% + full operate on Q4'17, boost net profit earning to RM40 - RM42mil. Expected Q4'17 EPS is raise to 5.3sen ~ 5.6sen. push up TP conservatively to $1.25 based on forward PE 17 (deep discount vs Hartalega forward PE 40). qps999 Good for me..in its very slow move clear my slot yesterday as Money Life Research suggested tgt 1.12 hit it...any way not met with loss la.